Found this gem while browsing Ownedcore elite section, might as well share since a lot of you probably play Pokemon Go. 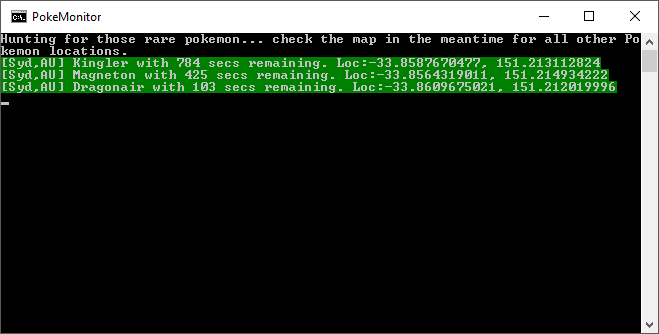 PokeMonitor is a simple but powerful addition to the Python script that generates maps. In addition to map generation, this script keeps the console window nice and clean, provides clear and concise copy-pastable messages that can be shared, plays a sound when a Pokemon is found and has the ability to export the data to an .sqlite database. The built-in Google Maps still loads and works as normal. As with all other scripts, this will not work when the API servers are down. If you have used any scripts before, please make sure you install everything from the "requirements.txt" from my download! Furthermore, if you have already used some Python Scripts before, copy the "pokemonitor.py" and "beep.wav" files out of the zip and into your script folder. Open Command Prompt to your script location, and type "pip install colorama". You may also need to install gpsoauth, which can be done with "pip install gpsoauth". You'll then be ready to start. To be able to copy and paste from the command prompt, you need to enable QuickEdit. You can do this by opening Command Prompt, right-clicking the title bar and selecting properties, and then checking the "QuickEdit Mode" box. To copy and paste, simply highlight the text and press enter. On line 87, you'll find the list named "notificationPokemon". You simply add (or remove) any Pokemon that you want to track from this list. You use their ID from the Pokedex. On line 85, you'll find the variable named "shoutLocation". Simply change this to whatever you think is most appropriate. Replace the "beep.wav" in the folder with any other .wav file. On line 725, you'll find the line out for the notification. Change this to whatever you'd like.